When Rios joined BAYADA as a client services manager nearly 22 years ago, she never imagined that activities such as testifying in front of 30 legislators at a New Jersey state budget hearing would become part of her job description. Rios soon overcame her fears, learning by experience that legislators are quite willing to support the home health care industry, once she helped them understand why that support was so important. 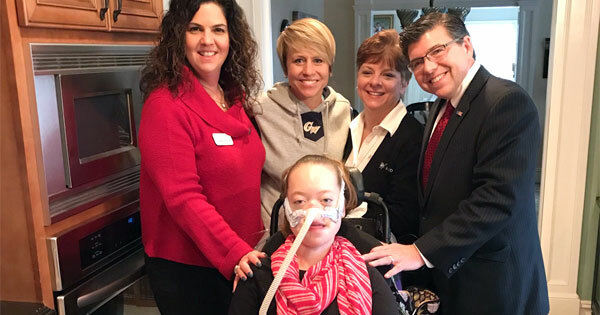 She has visited state representatives in their district offices, attended numerous events for legislators on both sides of the aisle, hosted family advocacy events in her office, became a member of the NJ Home Care Association, and coordinated home visits so that legislators could see, first-hand, how home care professionals make such a positive impact on the lives of their constituents. The BAYADA Government Affairs Hearts for Home Care Ambassador Program was established in 2011 to help build relationships with local legislators to educate them about the need for home health care – a high quality, low-cost health care option. Volunteer Ambassadors advocate for patient access to care and the need for fair, competitive wages, which are dependent on adequate Medicaid reimbursement rates. According to Rios, as the baby boom population ages, more people will require care at home. However, home care agencies are reimbursed at a lower rate than hospitals, making it a challenge to recruit enough care professionals to meet the increasing demand for services. To learn more about advocating for the home health care industry, visit heartsforhomecare.com.